Feb 10, 2008: The Penguins take on the Flyers in a chippy afternoon game at the Igloo. While watching from our seats in D23, my pregnant wife starts getting contractions -- may have been all the laughing at Downie skating away in the middle of a fight with Ruutu, no linesman needed. Anyhow, this was nothing new, she'd had bouts of contractions before, so of course we stick around. By the time the horn sounds, the Pens have held on to win 4-3 (go home Flyers!) and we are now taking these regular contractions much more seriously. Thankfully, Magee Women's Hospital is pretty close to the arena. 8 hours later, our son Harry is born, and I cut the cord wearing my Crosby jersey, earning a bloodstain on it that I cherish to this day! 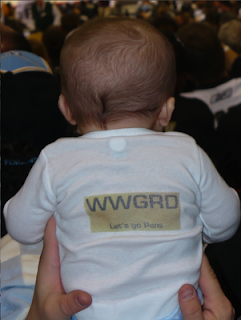 Harry got his first trip to the Igloo little more than a week later, and the Penguins responded by kicking off a streak of 15 straight home wins with Harry in attendance (we strategically missed the San Jose loss), sporting his WWGRD onesie at each.